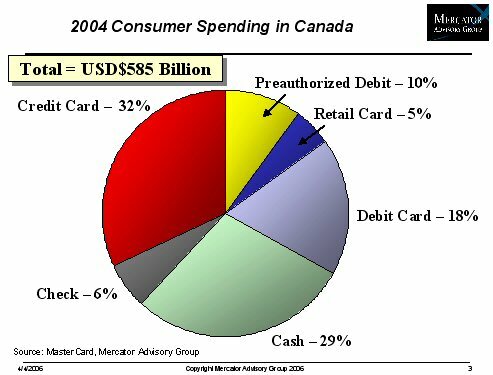 This individual Report The Canadian Credit Card Industry is available for purchase. This Report is available to members of Mercator Advisory Group’s Global Payments Advisory Service. Please be advised that this Report is normally part of a research and advisory service that provides ongoing support throughout the year. As such, this Report contains significant depth of content that is selected for its strategic importance to our members. (For a description of these services, see our Advisory Services section). Canada represents one of the largest markets for electronic payments in the world. The economy is large and the people are both wealthy and extremely comfortable with the use of plastic payment cards. Add in political and economic stability, as well as robust telecom infrastructure and consumer credit data, and it is no surprise that Canadians are among the per capita leaders in the use of plastic payments cards. The size and maturity of the electronic payments market has drawn some intense competition from domestic banks, international banks (largely US based) and one very important domestic consortium. There is a popular tendency to assume that the Canadian market is basically the same as the US market. This assumption, however, is wrong. "There are clearly some strong similarities between the US and Canadian markets," says Brian O'Keeffe, Director of Mercator's Credit Advisory Practice and the author of this report. "But the two markets have some large structural differences, and consumers some significant habitual differences that make them highly distinct. Any effort to simply replicate a US business model in Canada will likely prove futile." * How is the Canadian economy different from the US economy, and what does that mean about the market for credit cards? * How does the national debit platform (Interac) effect the competitive dynamic for credit card issuers? * How do Canadians use their credit cards, and how is that different from US consumers? * What does the competitive environment for issuers look like? * What do the current product offerings look like, and how substantially do they differ from US products? This report also includes a discussion of the major Canadian card issuers, their products and strategies, and the impact of foreign competitors on the market. Finally, there is an analysis of the regulatory environment in Canada, and how that will affect the dynamics of the market going forward.